There has been a sorry lack of good news coming out of Turkey in recent years, so it’s good to be able to report on one positive initiative by the government – which allows citizens to do something about embarrassing, idiotic or otherwise unflattering surnames. The Turkish government had good reason to impose surnames in 1934, not least because the sheer number of Turks called, for example, Mehmet the Son of Mehmet, rather complicated attempts at administration and may have even militated against a personal sense of identity; those Turkish memorials to wars which predated the new law, such as the 1915 Gallipoli Campaign, often bear long runs of identical names which can leave visitors with a distressing sense of victims whose enduring loss, for all their sacrifice, was to be indistinguishable from their fellows in perpetuity. In keeping with the example of the national leader, Mustafa Kemal, who adopted the surname Atatürk (Father Turk), many of his subjects went down either the patriotic or the proud route, with Öztürk (Pure Turk), Özdemir (Pure Iron), Özalp (True Hero), Korkmaz (No Fear) and even Ölmez (Immortal) all proving popular. One of my favourites, and the one I’d definitely have chosen for myself, is Dağdevıren (Overthrower of Mountains) Clearly, however, some didn’t take such a route. Some went for Aptal (Stupid), Donsuz (No Pants), Ördek (Duck), Deli (Crazy) and even Taşak (Testicle). These are among the names more than 100,000 people have opted to change under a temporary amnesty whereby they may circumvent lengthy and expensive court procedures by applying direct to local civil registry offices. In these cases family lore tends to point the finger at 1930s bureaucrats whose impatience with those who had failed to come up with surnames of their own evidently impelled them to mischief; I know a Şalvarli (Trousers) family whose members assume their forebear must have been wearing a striking pair of strides when he turned up without a plan to file his surname. In other cases, however, I detect the native cussedness of people frustrated by yet another western imposition; in barely a decade, starting in 1923, Turks had been required to adopt a new alphabet, calendar and dress code, not to mention accepting a President rather than Sultan as head of state and a great deal besides. Unlike our own surnames, often abraded by long usage and the circumstances of their adoption long since lost, Turkish surnames still seem freshly coined. They act, then, as a reminder of the sweeping changes that took place in Turkey not yet a century ago and of the distance that Turks have travelled. They also tell of the resistance that many felt about being remade in a western form not of their choosing – which bears on the tensions so evident in Turkey today. ​ They are also, of course, an enduring source of delight, which is why a part of me feels uneasy about this particular initiative. While I get why the Testicles and the Ducks might have had enough of their surnames, I fear for some of those other glories that I’ve picked up on my travels. I never got Mr Mavituna to explain the origins of his surname, but it would certainly sadden me if the Blue Danube family decided it was time they were called something else. This tour combines my two favourite parts of Turkey, places of luminous, even unearthly beauty, which give magical insights into both the contemporary culture and historical sweep of these lands. We start in Cappadocia, a compact and compelling volcanic region right at the heart of inland Turkey, which could not be more distinctive from the surrounding sere steppelands. Geology like this is seen nowhere else on earth; the other place to look is in the mind, where the obvious reference point is Tolkein. The volcanic eruptions which once buried the land beneath a hundred feet of a pliant lava have been shaped by the weather (over millions of years) and humankind (over perhaps a few thousand years) into what we see today; bizarre natural formations and valley canyons as well as troglodytic settlements: homes, chapels, monastery complexes and extensive ‘underground cities’ which throw remarkable light on the settled history of these lands. We have been careful to distinguish the Cappadocian part of this tour in two respects: all too often visitors to Cappadocia fall victim to its popularity when they suffer the crush which can befall them at major sites like Göreme’s Open Air Museum, the best known cluster of rock-carved Byzantine chapels and monastic spaces. The problem here, as anybody who has endured the struggle for access to the tombs in Egypt’s Valley of the Kings will also know, is that these chapels were not built for crowds but for solitary contemplation (which is why there are an estimated 3,000 of them across the region). Nor was access to the extraordinary underground cities, where local populations sought refuge from raiding Mongols and Saracens, designed to allow large numbers of people access at any one time but the tunnels were deliberately made narrow so they could be easily shut off in times of danger. Bearing this in mind, we’ve opted largely to visit far less well known but hugely rewarding sights - the ‘underground city’ complex at Mazi, the intensely moving church at Pancarlik - which I’ve been thrilled to discover in the decades I’ve been visiting Cappadocia, and which we are sure of having to ourselves. And though we do include Göreme’s Open Air Museum, we’ll be sure to visit before the crowds (you’ll forgive us the early start, I’m willing to bet, if only from the moment you see the tour coaches massing as we conclude our visit). The other aspect of this part of the tour is the walking; there is a fair amount of it but it’s largely on the flat along valley bottoms of compacted dust, which makes for delightfully easy going. The landscapes are enchanting: orchards (this being September, guests can look forward to discovering that there is truly nothing like a Cappadocian apple), walnut groves, smallholdings and bird song, plus wonderful carved and decorated details like the valley-side pigeon cotes which until a few decades back the local farmers regularly emptied for the precious fertilising guano collected there. We’ll stop and talk to locals busy harvesting walnuts; I’ve more than enough Turkish to engage them en route. The ‘transfer’ section of the tour gives a real sense of just how extraordinarily rich the historic heritage of Anatolia really is. Our first stop, Eski Gumuş, is right on the edge of Cappadocia and rarely visited, but this hidden monastery is home to perhaps the most exquisite wall frescoes in all Cappadocia. Then there’s Konya, home to Sufi visionary and ecstatic whirler Mevlana, but now a place of rather sterner and orthodox Islamic character, with an abiding sense, I often feel, of eastern steppelands like Iran. People are often moved by the rapt devotion on show at Mevlana’s Konya shrine; I’ll confess the austerity of the modern city can feel unsettling and I’m often ready to move on to gems like the wooden mosque at Beysehir and the amazing carved monument at Eflatun Pinar, a spring sacred to the ancient Hittites and in its way quite as otherworldly as Cappadocia’s landscapes. It’s with this wonderful mass of fresh impressions and experiences that we board our gulet at Göcek. Anybody who’s travelled with Westminster Classic Tours will know what to expect onboard ship, but they may not be familiar with the particular beauty of the Lycian shore. What I especially love about this region is not only the landscape – the deep wooded coves and the high mountain backing – but the sense that these ancient people were resistant to absorption by the classical world; in their particular architecture - the amazing and ubiquitous boat-shaped sarcophagae, the pillar tombs at sites like Xanthos - there’s less of ancient Greece and as much of Persia, even Egypt. Here we are truly in the East. I can’t think of a better way of combining the amazing Anatolian interior with these heavenly shores; I’ll hope you’ll agree. Let us know if you’ve any unanswered questions. This week I was in Istanbul, researching a travel article for the Sunday Times, meeting the publisher of a soon-to-be Turkish edition of my first book, A Fez of the Heart, and generally refreshing myself on my favourite city. I had not imagined that the week would end with police violence and tear gas, mass arrests and with the city in lock-down. Thursday began with a meeting with a Turkish journalist, ostensibly to discuss the environmental issues raised in my Meander. The book details a canoe journey I made down western Turkey’s Büyük Menderes River, which the State Water Works, an organisation in thrall to the region’s industrialists, irrigators and hydro-electric interests, has in parts drained, elsewhere polluted and generally desecrated. 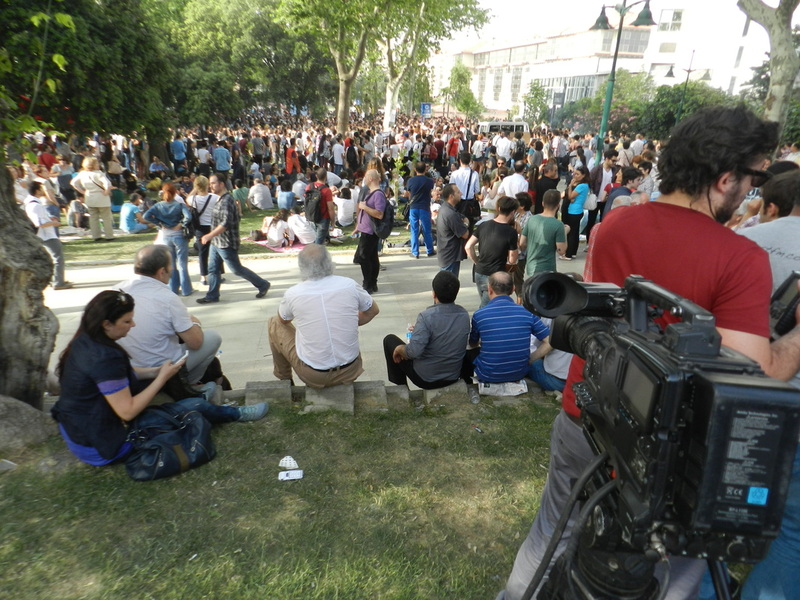 Our conversation led to further observations on the governing party’s growing authoritarianism and philistinism, particular in terms of the environment, which the journalist exemplified with reference to the ‘sit-in’ protest taking place in Taksim’s Gezi Parkı (‘Wander Park’). The government meant to demolish the park before developing it as an Ottoman-style shopping mall. I’m no political journalist, but as a travel writer I’m certainly qualified to observe that Istanbul has all the shopping malls it will ever need; what it cannot afford to lose is another square inch of open space. In the course of my stay in Istanbul, I was forcibly struck by the acute absence of the garden squares, parks and other open spaces which commonly relieve the urban experience in the West. Great expanses of this city are chock with buildings in which a tiny balcony or a raffia-topped wooden stool at the front door constitutes the outdoor patch for many residents. I saw how Istanbullus wishing to picnic or play were increasingly squeezed into the few green spaces that remain, not least along the Asian shores of the Bosphorus where public access is restricted to brief stretches of parkland in places like Paşalimanı. Through the course of the week I had a growing sense of just how acute this shortage was. I found myself seeking out space in marginal places like the cemeteries, especially Karacahmet near Üsküdar, even in the courtyards of the mosques. The most effective escape was to take to a Bosphorus ferry, however crowded, if only for the comparative breadth of the waterscapes on offer there. This perspective was increasingly reinforced through the course of Thursday when I wandered at length through Pera and Beyoğlu. Arriving largely by chance at Taksim Square, where I had an hour to fill before visiting an old friend in Mecidiyeköy, I wanted nothing more than a peaceful place to sit. It was this universal need that drew my eye to the rare greenery abutting the north side of Taksim Square. The first I knew that all was not well in this apparent oasis was when I noticed the black-clad police and the water cannons. Beyond the police enclosure people were streaming through the trees which I now recognised as Gezi Parkı, site of the protest. Here, on every available space, people were lying on the grass, sometimes next to the tents they had erected. There were stalls beneath placards advertising environmental and political groups where people were signing petitions. Painted sheets proclaiming the sanctity of nature, the evils of capitalism and the cupidity of the Prime Minister (his portrait with dollar signs photo-shopped into his eyes), had been hung from the trees. Local vendors were selling corn cobs, köfte (meatballs) sandwiches and bottled of water. A festival atmosphere prevailed but it was laced with defiance. Gezi Parkı is a rare shaded haven in the city. But the fact that its immediate neighbour is the Intercontinental Hotel, with both the Hyatt and the Ritz-Carlton close by, indicates that it is also a coveted piece of real estate – one that the government has blithely reassigned for commercial development. This would not do; not, as one female protestor who wished to stay anonymous explained, since the police’s attempt to clear the park at 5am that same morning had entailed ripping down the tents and ejecting the occupants from their sleeping bags, hospitalising one peaceful protestor with a boot to the testicles. There was to be a stand. The gathering crowds included not only environmentalists and anti-capitalists but also students, professionals and high-school children. It constituted a broad coalition of defiance who saw in the blatant injustice of the Gezi Parkı development the most glaring evidence so far of the ruling party’s authoritarianism, ecological vandalism and refusal to consult with the people. Over the years Prime Minister Erdoğan has struck me as a man of sure-footed political judgement. By his populism he has established an impressive rapport with the poor and the conservative right. But at Gezi Parkı, that political savvy appears to have deserted him; apart from the contractors there are few who see the proposed development as anything other than environmental philistinism. The plan for the park was a reminder to the protestors, moreover, of everything else that this aggressively Sunni-oriented government had to answer for: most recently, further curbs on the right to drink alcohol and the decision to name the Third Bosphorus Bridge, where work began this week, after Sultan Yavuz Selim, whom the country’s Alevi or quasi-Shia minority revile as the notorious slayer of their forebears. Flying out on Friday morning - as the news journalists were flying in – I wondered if Turks would forgive their Prime Minister for denying them their place to sit. The Leader's Photograph: Reflections on Adnan Menderes 50 Years after his Execution. A few weeks ago I was hiking near Milas in western Turkey when I was invited into a village home in the advanced stages of collapsing about its elderly occupants. Beyond the overgrown garden and rotten staircase, however, the thickly-socked Mehmet and his wife had partially maintained the main room, at least to the point of hanging the walls with pictures of their large, long dispersed family. What caught my eye, however, was the portrait which hung in pride of place – of a former national leader whom the couple clearly held in deep regard. No prizes, you might think, for guessing that the portrait was of Kemal Atatürk, war hero and secularist ideologue, who emerged from the ruins of the Ottoman Empire to found the Turkish Republic in 1923, zealously remaking the country along western lines – in terms of its civil code, calendar, dress and script - until his death 15 years later. Except that the portrait was in fact of the country’s first democratically elected Prime Minister, Adnan Menderes, who was toppled in Turkey’s first military coup in 1960, and executed the following year. Menderes, who took his surname from the nearby valley of the classical Meander where his family’s landed interests lay, oversaw the liberalisation of the Turkish economy in the 1950s, albeit at the expense of record trade deficits and ensuing economic and social unrest. What further alienated him from the ‘Kemalist’ establishment, however, was that he assiduously courted Islamic traditionalists smarting from decades of zealous secularisation. Under Menderes the call to prayer was once more permitted to be made in the traditional Arabic. Religious schools were opened. Islamic periodicals were published. 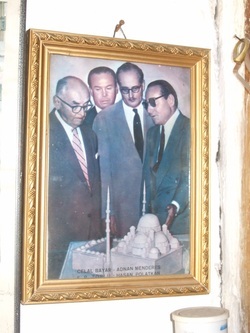 Many of the country’s mosques were reopened; the portrait in Mehmet’s house pointedly showed the raven-haired Menderes, in the dark glasses and brilliantine of the period, presenting an architect’s model of a newly commissioned mosque to his cabinet colleagues. In the years following his execution by the military, self-styled guardians of the secular state, such images of Menderes, accused among other things of abandoning the country to the forces of reaction, were formally proscribed. In later decades, however, popular outrage led political opportunists to facilitate the man’s gradual rehabilitation. Universities, institutes and other organisations are now named after this hero of democracy, as is the airport of the country’s third city; a flight between Izmir’s and Istanbul’s airports, literally from Adnan Menderes to Atatürk, may remind passengers of the classic opposition between devout conservatism and constitutional secularism, one which continues to define Turkey. With conservatism by all accounts currently winning out. The coup which led to Menderes’ execution in 1961 set in train a pattern whereby the Turkish military repeated intervened in national politics whenever they felt the country’s secular constitution was under threat. The governing Islamic party was repeatedly proscribed, only to prove itself hydra-headed, reappearing time and again under another name, and always with additional popular support. Levels of democratic support for the ruling Islamic party of Recep Tayip Erdoğan are now such that the military appears cowed; the democratic process may finally be assured in Turkey. As we left the house, my guide told me that many devout country people saw Adnan Menderes as a martyr to their values. ‘The governing Islamists know this,’ he added. ‘The secular freedoms are increasingly under attack. Some provinces are extending their alcohol bans.’ Erdoğan’s AK Party, economically self-confident and increasingly ambivalent towards a debt-crippled Europe, now seems intent on extending the same programme of social conservatism which cost Menderes his life. Some commentators are even beginning to look out for the signs of a logical corollary to this process and to the rehabilitation of Adnan Menderes; the eventual dismantling of the cult of the man who remains on the coins, banknotes and walls almost 75 years after a premature death brought on, in part, by cirrhosis of the liver. We left the village by Atatürk Road. The sign was rusty and uncared for. Jeremy Seal is a travel writer with a particular interest in Turkey.